With February 14 just around the corner, some may be wondering what type of weather can be expected based on historic Valentine’s Day climatology. Although meteorological spring begins at the start of next month, February is often known to bring a wide range of weather across the Northeast and that has been consistent with the conditions so far this year. Brutally cold temperatures and wind chills swept across the region right at the start of this month followed by record warm temperatures in some areas only four days later. Average maximum temperatures on Valentine’s Day mainly range from the 30s to 40s across much of the Northeast. For a higher chance of chilly conditions, Caribou, ME, is the place to be, with an average minimum temperature of only 2.6˚F. Low temperatures are usually in the teens to mid-20s across much of the Northeast on Valentine’s Day, reminding us that winter is still here. Towards the southern part of the region, average high temperatures are a bit warmer with Charleston, WV, typically recording temperatures around 50˚F on Valentine’s Day. A few locations in New York, along with Elkins, WV, have some of the highest chances of experiencing measurable precipitation on Valentine’s Day, compared to the rest of the region. Click to enlarge. February often brings wet weather to the Northeast, and Valentine’s Day seems to be no exception. Seven of the 35 major climate sites across the region have over a 50% chance of experiencing measurable precipitation (at least 0.01 inches) that day. 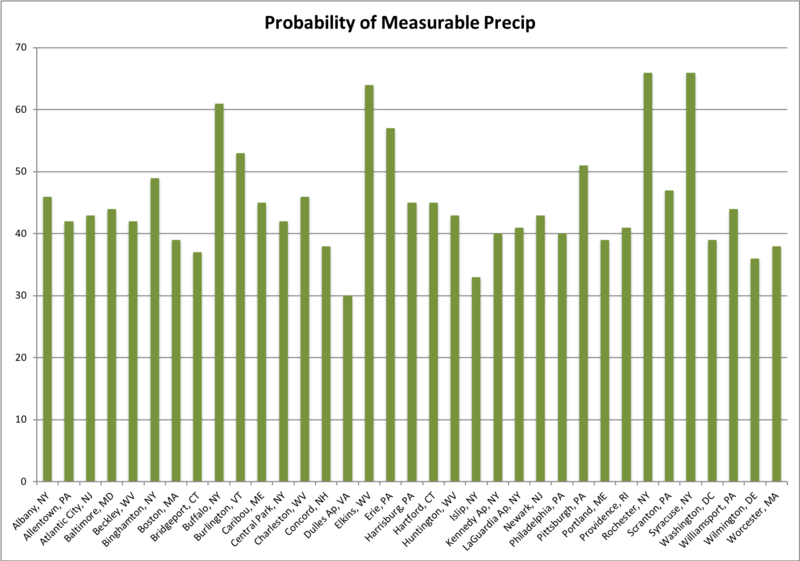 Historically, both Rochester and Syracuse, NY, are tied for having the highest probability of recording measurable precipitation on Valentine’s Day. Valentine’s Day snowfall probabilities are variable across the region. Click to enlarge. 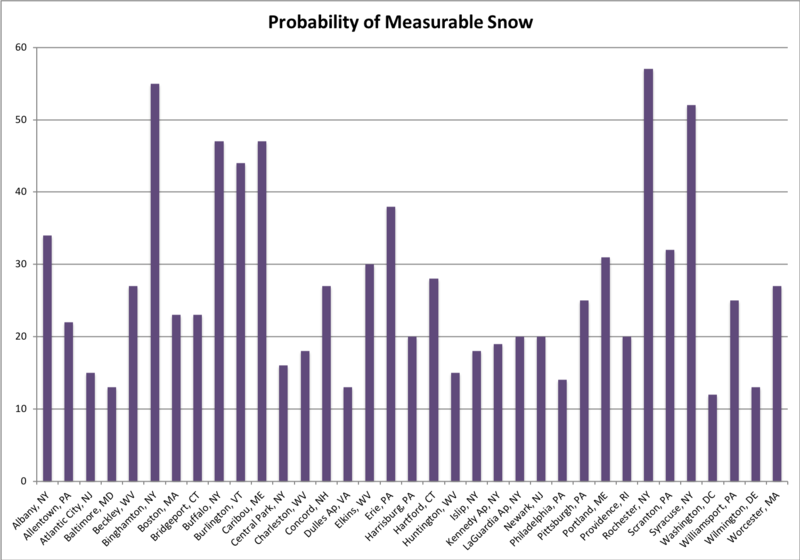 Binghamton and Rochester, NY, typically have the highest probabilities of recording measurable snowfall, which is defined as a tenth of an inch of snow or greater. According to historic climate data, Washington, DC, and Wilmington, DE, are among the least likely of all the major climate sites in the Northeast to experience a snowy Valentine’s Day. Be sure to check the latest forecast from the National Weather Service to see what weather you can expect on Valentine’s Day this year!